Recently I have contacted Sebastian Gutberlet to find out more about the Kaweco Perkeo. All I knew is that there used to be a Kaweco fountain pen with that name in the (early?) 20th century. 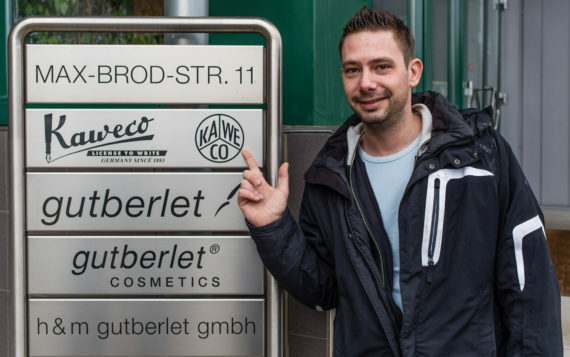 Just a reminder, Sebastian is the son of Michael Gutberlet, the man who revived Kaweco. The main intention of asking Sebastian about the Perkeo was to collect some more information for the Stationery Wiki – because I couldn’t find much information on the web, but then I thought: why not turn it into a blog post. It came as quite a surprise to find out that this new Perkeo has been in the making for a very long time. Sebastian’s grandfather Horst Gutberlet ((Michael Gutberlet’s father)) actually developed the new Perkeo’s precursor in 1997. The prototype was resting in Michael Gurberlet’s desk for many years before now being finalised and released. I’ve mentioned more than once that when I went to school you had to use a fountain pen, at least in Bavaria where I’m originally from. I’m not sure about the current pen situation in schools there, but my guess would be that on the continent there are (still) many schools where pupils write with fountain pens. The grip zone is supposed to help the pupil with holding the pen the right way. As a beginner’s fountain pen the Perkeo is probably aimed at these pupils (..but that doesn’t mean we adults can’t have fun with this pen, too). It will be available in four colour combinations and according to Sebastian Gutberlet the Perkeo will be released in Juni or July the latest. I’d like to thank Sebastian Gutberlet for answering my questions and providing pictures for this blog post. I saw the May availability on the Goulet page, but thought that if Kaweco says it’s June or July that must be right. Is that the Manish Orenz you mean? My favourite is the white and blue one, followed by the yellow and black one. Yes, I got a pink and taupe Manish Orenz, which matches almost perfectly with Cotton Candy. I just love the names Kaweco picked. “Bad Taste” is one of them which made me laugh out loud while at work. Gunther, even though I like the Noris so much I somehow didn’t think of the Noris when I saw the yellow/black Perkeo. It would really be a good fit. I am wondering what has inspired Kaweco to select “Bad Taste” as a product name, even as a prototype. Either way it is adding humor to an already attractive pen.